Any invited country, as well as the host country, is represented by one team. A country can only take part in the IYPT that has already taken part in the past or sent an observer in one of the last three years. The IYPT team is composed of five secondary school students. The secondary school graduates could participate in the IYPT in the year of their graduation. The participation of university students is not allowed. The LOC may allow participation of teams of four or three students. The composition of the team cannot be changed during the Tournament. The team is headed by a captain who is the official representative of the team during the PF. 3. The team is accompanied by two team leaders. The IYPT is carried out in a period determined by the LOC (from May to July). All teams participate in five Selective PFs. Selective PFs are carried out according to a fixed schedule as detailed in the attachment to these Regulations. Numbers are ascribed to teams by lot. The best teams participate in the Final PF. The host country provides a cultural program for the participants. The Reporter presents the essence of the solution to the problem, attracting the attention of the audience to the main physical ideas and conclusions. The Opponent puts questions to the Reporter and criticizes the report, pointing to possible inaccuracy and errors in the understanding of the problem and in the solution. The Opponent analyses the advantages and drawbacks of both the solution both thpresentation of the Reporter. The discussion of the Opponent shoulotnot become a presentation of his/her own solution. In the discussion, the solution presented by the Reporter is discussed. The Reviewerpresents a short estimation of the presentations of Reporter and Opponent. The Observerdoes not participate actively in the PF. 1. All problems presented in the same PF must be different. If there are less than five problems left to challenge, the bans d), c), b), a) are successively removed, in that order. During the Selective PFs the Reporter may reject the challenge of three different problems in total without penalty. For every subsequent rejection the coefficient of the Reporter (see section X) is decreased by 0.2. This reduction continues to apply during the following selective PFs. The three teams having the highest TSP in the Selective PFs participate in the Final. In case teams have equal TSP, their participation in the Final is decided by FW. If team(s) winning all their Selective PFs (FW=5) did not reach the Final by TSP, the best of them (determined by TSP) takes part in the final as fourth team. The order of presentation in the Final is determined by position by entering the final: the higher the position, the lower the number in the scheme of section VI. Students in the top half (rounded up) of participating teams receive medals. The students of the team winning the Final are awarded the winners’ cup. If two or three teams have the same SP result in the Final, the winner is nominated according to the highest TSP, in case of equality by FW. All teams participating in the final are awarded 1st place certificates and gold medals. The five best teams not participating in the final are awarded 2nd place certificates and silver medals. 3rd place certificates and bronze medals are awarded to students in all other teams finishing in the top half. All other students receive certificates of participation. Team leaders obtain certificates indicating the ranking of their team. Colliding two large steel balls with a thin sheet of material (e.g. paper) in between may “burn” a hole in the sheet. Investigate this effect for various materials. Two similar flasks (one is empty, one contains water) are each connected by flexible pipes to a lower water reservoir. The flasks are heated to 100°C and this temperature is held for some time. Heating is stopped and as the flasks cool down water is drawn up the tubes. Investigate and describe in which tube the water goes up faster and in which the final height is greater. How does this effect depend on the time of heating? A candle is balanced on a horizontal needle placed through it near its centre of mass. When the candle is lit at both ends, it may start to oscillate. Investigate the phenomenon. Maximize the output mechanical power of the system. Place a compass on a table. Place a similar compass next to the first one and shake it gently to make the needle start oscillating. The original compass' needle will start oscillating. Observe and explain the behaviour of these coupled oscillators. Place a mobile phone inside a metallic container with a hole in it. Investigate under what conditions the mobile phone starts to ring after calling it. When a photo is taken with a flash, bright "disks" may appear as shown in the picture. Investigate and explain the phenomenon. To prevent dripping from a bottle after pouring, it can be turned slightly. Investigate the motion of the bottle for no drop to fall. Put a plastic cup on a thin layer of liquid on a flat solid surface. Make the cup rotate. On what parameters does the rotational deceleration of the cup depend? A skateboarder on a horizontal surface can accelerate from rest just by moving the body, without touching external support. Investigate the parameters that affect the motion of a skateboard propelled by this method. A vertical air jet from a straw produces a cavity on a water surface. What parameters determine the volume and depth of the cavity? Investigate the drying process of a vertical wet paper sheet. How does the boundary of drying move? Look down a cylindrical metal tube which is shiny on the inside. You will notice dark and light bands. Investigate the phenomenon. The "simple transformer law" relates output voltage to input voltage and turns ratio. Investigate the importance of frequency and other parameters in determining the non-ideal behaviour of transformers. Put a hot metal ball on parallel horizontal rails. The ball starts to move. Investigate the phenomenon. Investigate how the formation of sand ripples under shallow water depends on various parameters. Investigate the motion of water droplets falling on a hydrophobic surface (e.g. coated with soot or teflon). A mass is hung from the middle of a horizontal wire. 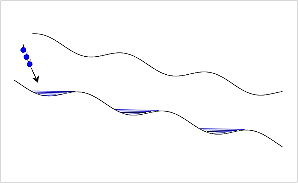 When a current is passed through the wire, the mass may start to oscillate. Describe and explain this phenomenon. 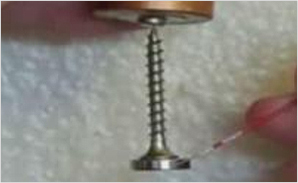 Attach a strong light magnet to the head of a steel screw. The screw can now hang from the terminal of a battery. Completing the circuit by a sliding contact on the magnet causes the screw to rotate. Investigate the parameters that determine the angular velocity of the screw. After traffic has used an unpaved road for some time the surface of the road gets a "wave" structure with a well defined wavelength. Investigate and explain this phenomenon. Blacken a spoon using a candle flame. If you immerse the spoon in water it appears glossy. Investigate the phenomenon and determine the optical properties of such a "mirror." Pull a thread through the button holes as shown in the picture. The button can be put into rotating motion by pulling the thread. One can feel some hoasticthe of the thread. ing motion bhoastic properties of such a system. A tube passes steam from a container of boiling water into a saturated aqueous salt solution. Can it be heated by the steam to a temperature greater than #d0d0d0;">A shallow vessel contains a liquid. When an electric and magnetic field are applied, the liquid can start moving. Investigate this phenomenon and suggest a practical application. Two balls placed in contact on a tilted groove sometimes do not roll down. Explain the phenomenon and find the conditions under which it occurs. When a smooth column of water hits a horizontal plane, it flows out radially. At some radius its height suddenly rises. Investigate the nature of the phenomenon. What happens if a liquid more viscous than water is used? Spin can be used to alter the flight of balls in sport. Investigate the motion of a spinning ball, for example a table-tennis or tennis ball, in order to determine the effect of the relevant parameters. A mixture of starch (e.g. corn flour or cornstarch) and a little water has some interesting properties. Investigate how its "viscosity" changes when stirred and account for this effect. Do any other common substances demonstrate this effect? When you apply a vertical magnetic field to a metallic cylinder suspended by a string, it begins to rotate. Study this phenomena. Take two glass prisms separated by a small gab. Investigate under what conditions light incident at angles greater than the critical angle is not totally internally reflected. 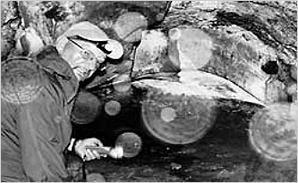 Granular material is flowing out of a vessel through a funnel. 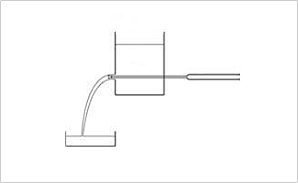 Investigate if it is possible to increase the outflow by putting an "obstacle" above the outlet pipe. A transparent vessel is half-filled with saturated salt water solution and then fresh water is added with caution. A distinct boundary between these liquids is formed. Investigate its behaviour when the lower liquid is heated. 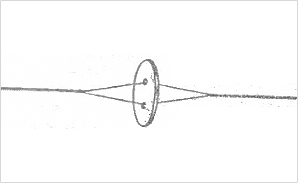 In a ‘Kundt’s Tube’ type of experiment the standing waves produced can be made visible using a fine powder. A closer look at the experiment reveals that the regions of powder have a sub-structure. Investigate its nature. The ‘didgeridoo’ is a simple wind instrument traditionally made by the Australian aborigines from a hollowed-out log. It is, however, a remarkable instrument because of the wide variety of timbres that it produces. Investigate the nature of the sounds that can be produced and how they are formed. 8. Why does a kite move in such a way? Are there other stable tracks? Take a box and devide into a number of small cells with low walls. Distribute some small steel balls between the cells. When the box is made to made to oscillate vertically, the balls occasionally jump from one cell to another. Depending on the frequency and the amplitude of the oscillation, the distribution of the balls can become stable or unstable. Study this effect and use a model to explain it. 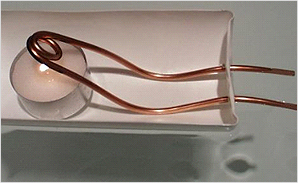 Construct a heat engine from a U-tube partially filled with water (or another liquid), where one arm of the tube is connected to a heated gas reservoir by a length of tubing, and the other arm is left open. Subsequently bringing the liquid out of equilibrium may cause it to oscillate. On what does the frequency of the oscillation depend on? Determine the pV diagram of the working gas. The resistance of the tungsten filament in a light bulb shows a strong temperature dependence. Build and demonstrate a device based on this characteristics. Construct a torsion viscometer. Use it to investigate and explain the differneces in the 'viscous' properties of hens' eggs that have been boiled to different extents. Develop a device that will drain wet sand, with the aid of an electrical voltage but without significant heating. It is sometimes argued that to cool a pot effectively one should put ice above it. Estimate to what extent this is more effective than imore eice is put under the pot. How can you measure the electro-conductivity of salt solutions without using direct contact electrodes? Analyse the problem and demonstrate your device.